Travelodge Anaheim Inn and Suites is located in the beautiful resort city of Anaheim, within walking distance of the DISNEYLAND Resort which includes DISNEYLAND Park, DISNEYS CALIFORNIA ADVENTURE Park and the DOWNTOWN DISNEY District. The Travelodge Anaheim is a DISNEYLAND Resort Good Neighbor Hotel. Also located nearby the Travelodge Anaheim Inn and Suites, is the home field of the Anaheim Angels as well as the famous Arrowhead Pond Arena. 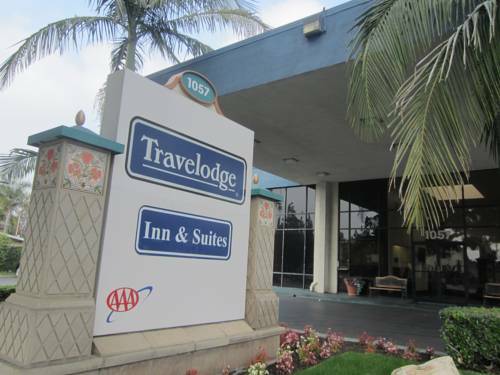 Conveniently located off the 5 freeway, the Travelodge Anaheim is the ideal rest stop for a long journey or for a central place when visiting southern California. DISNEYLAND Resort PARK HOPPER Tickets available for purchase at the front desk. The friendly and hospitable staff of the Travelodge Anaheim, are experts in pointing you in the right direction, whether you are looking for an attraction, a tour, a golden beach, or something different to eat. Drop by the front desk and let them do the research for you. The Travelodge Anaheim Inn and Suites boasts a first class view of the fireworks at the DISNEYLAND Resort. Try out our STAR LIGHT rooms, available upon request - turn the lights off and the stars appear in your room. You can also relax and enjoy the typical Southern California weather beside the full sized outdoor heated pool or take a moment to pamper yourself in the spa tub. Everyone at the Travelodge Anaheim looks forward to welcoming all of its guests. A 2 percent Tourism Improvement District Fee will be charged to each occupied guest room.